Kanye West has a day out with his dad. Kanye West fans have been pining for the rapper's return to the music scene after he kept a decidedly low profile throughout most of 2017. A feature spot and a concert have done little to ease the anticipation among the Yeezy supporters who walk the Earth but, before he drops any new musical material, the mythical hip-hop continues to put family first, getting in a historic museum stop while in Washington D.C. with his father. Kanye and Ray West hit up the Smithsonian National Museum of African American History and Culture yesterday (January 9th), surprising unsuspecting passerby with their presence. In fact, he supposedly distracted a museum tour that was already in progress. However, Ye was totally locked in to what the establishment's guide was saying about a specific collection, listening intently and nodding his head once in a while in response to things she would say. You can check out a clip of his visit, caught by a stranger's smartphone, below. This museum trip is just one of several well-received public appearances made by Kanye in recent weeks. He also made a cancer patient's dream come true not long ago, rapping to a fan over the phone before she passed away after a long battle with the disease. 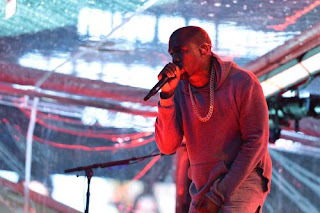 The episode wasn't publicized on social media until after the fact, proving that Kanye wanted to keep as low a profile as possible in that scenario.